Update: Bloc has removed the post from their website so the official blog is not accessible. We have seen quite a few startups who offer to teach courses like Microsoft office suite and even Programming languages. Users too have taken a liking to such online institutions. 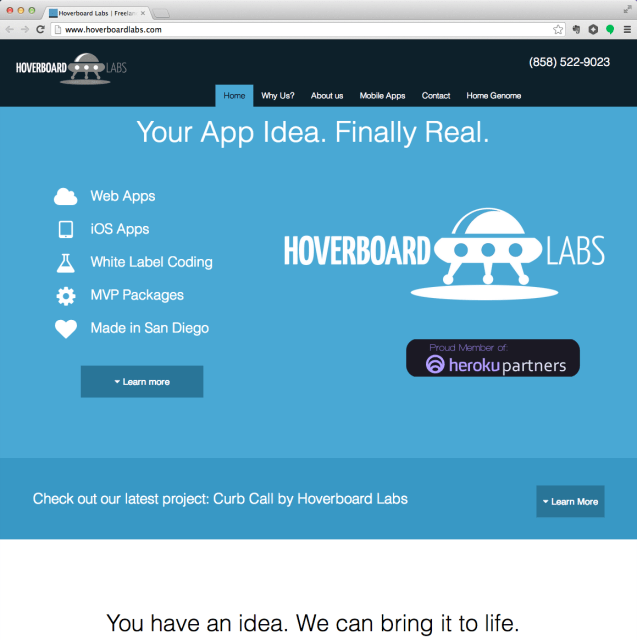 Bloc Inc. is a new Online coding academy who uses a different approach to teach, compared to the ones we have seen. They have raised $2 Million in financing round lead by Harrison Metal with Baseline Ventures, First Round Capital and Learn Capital, announced Bloc today in their company blog. The company was founded by Roshan Choxi (CEO) and Dave Paola (CTO) in 2012. Bloc debuted in early 2012 at the Launch conference, helping seed the company’s user base with the first few thousand signups. It is located in the SOMA district of San Francisco. It has paid courses and unlike other free online code teaching academies, it offers an online apprenticeship model. Explaining the company’s goal, Roshan Choxi says, “We believe the one-on-one apprenticeship model, which employs real world projects and industry standard tools, is superior to classroom learning“. Bloc takes a different approach in teaching online by providing the Learner with a Mentor, giving the user a one-to-one connection with the mentor who solely focuses on and motivates the user. 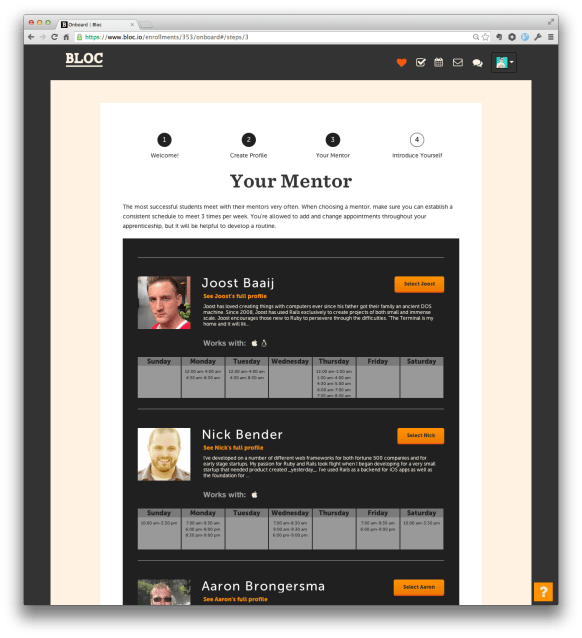 Bloc claims to have a lot of mentors in many different timezones so that the users can choose their mentor in their available timezone depending on their working hours. They say many of their users are full-time employed users who try and find time to learn without affecting their work, which is why the Mentor hours are available round the clock. The company does not provide a jop placement guarantee “at this time“, but it probably will after some time once the company grows more and collaborates with some companies. At present, it offers a 12 weeks course which costs $4,250 and has 3 payment plans. The 12 weeks course includes 25 hours per week in 3 weekly sessions. All you require would be an active internet connection, the timezones range from GMT -9 to GMT+2. You can also learn more about their program by attending their Information Session. Another aspect of Bloc Inc which makes it different from other online courses is, the learner wont just be learning skills, they would also be slowly learning to create their own projects. Starting from building clones to sites like Reddit and Wikipedia, by the end of the course the users will successfully be able to create their own work. Showing off your work in an interview compared to explaining your skills verbally makes a huge difference. They proudly recall a story of one such successful Bloc graduate named, Seth Seigler, who was a Real Estate Agent prior to learning Web development from Bloc. Seth later went on to build an “uber for real estate” and sold it to a real estate firm, where he’s now CTO. Seth says, “Bloc is the perfect hybrid between the the self-paced tutorials and the full-time bootcamps. At the end of Bloc, I knew how to learn and how to complete any project.”. There are a lot of branches within the IT industry and if you wish to enter the world of coding, Bloc appears to be a good option. However, if you want to try to learn coding yourself without the need to pay someone, you may want to try free options like KhanAcademy or Codecademy combined with reading a book. The USP of learning at bloc, however, remains the mentor it provides plus the ability to create your own project towards the end of the course. Something that can be quite difficult, if not impossible, if you are a beginner. Let us know what do you think about Bloc and its program. Would you consider enrolling in their program or would rather learn for free.